In New Zealand window tint is legal to use up to a certain darkness level. This article will give you a brief rundown of New Zealand window tint laws and other regulations concerning these vehicle modifications. Windshield: no tint allowed except an anti-glare band on top part. Front side windows: minimum 35% VLT allowed. Back side windows: minimum 35% VLT allowed. Rear window: minimum 35% VLT allowed for passenger vehicles, any percentage for others. In New Zealand you can not legally apply any tint percentage on front windshields. However you can apply anti-glare bands on top part of windscreens which (as law defines) extend no further than bottom of the sun visors when folded against the windshield. Any print (as in letters or other advertisements) applied must also not extend further than 10cm from the top or 5cm from sides. If you decide to tint the top portion of your windscreen it’s a good rule of thumb to tint no more than 12cm in total, with 10 being on the safe side. Overall visible light transmittance on windshields must not be less than 70%, but this is valid only for factory-made tinted windows. New Zealand law clearly states windshields may have no overlay except as noted above. Windows to the immediate left and right side of driver, and side windows behind the driver may have no less than 35% VLT (Visible Light Transmission). 35% VLT means 65% of total light coming through windows is blocked. See our window tint calculator for visual examples of various levels of darkness! Rear window (rear windshield) tint requirements of 35% only apply to: sedan, station wagon, hatchback, sports car, and convertible cars (Class MA vehicles). Trucks, vans, SUVs, limousines, body transfer, or other vehicle types can have any tint darkness. Important: if rear window is tinted vehicle must have exterior rear view mirrors on left and right side. New Zealand window tint laws state that no window overlays may have a mirrored effect sufficient to dazzle other road users. Although the reflectance level is not clearly defined we do not recommend using window tint with any light reflection. As mentioned above, ensure you have left and right rearview mirrors in case you tint back windows. Stickers, text, or other similar advertisements may only be installed on top 100 mm of windshield and other windows, and 50 mm from other edges. Rear window can be fitted anywhere on non-Class MA vehicles. NZ laws also allow installing window tint with any darkness level on sunroofs. Furthermore any scratches, discoloration, bubbling or other defects in window tint which impair a driver’s vision are not permitted. New Zealand Transport Agency (Vehicle Windows, wipers and mirrors). NZ Land Transport Rule, Rule 32012/1 (Glazing, Windscreen Wipe and Wash, and Mirrors; see under Section 3 – Modification and repair of glazing). Window tint laws in New Zealand were enacted in 1999 and updated in 2007. 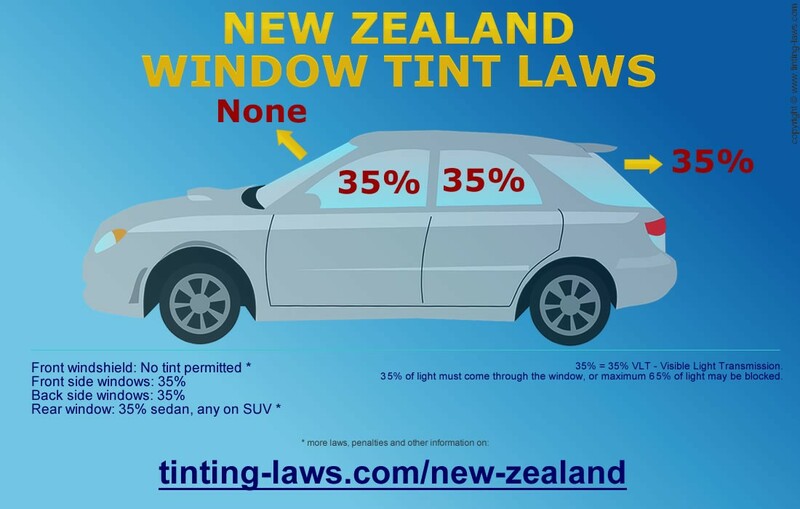 Our information about New Zealand Window Tint Laws was last updated and verified in 2018 and 2019. Our articles are constantly checked for accuracy by our partnered local traffic law experts, but in case any of our info provided is not up to date or correct be sure to contact us so we can fix it. Thanks! Window Tint Darkness Calculator - preview how window tint will look on your vehicle.